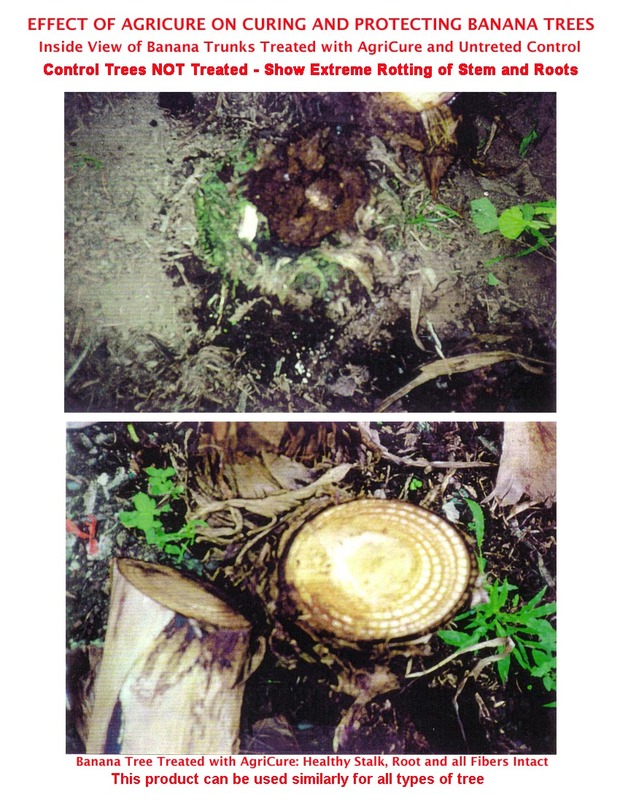 This page provides some actual visual display examples of various tests that have been undertaken in extreme conditions, using our Agri-Cure TM all natural product, with both of these tests being undertaken in Banana plantations where root and stem rot had created huge problems that continually spread from plant to plant. These are actual photographic results of these tests where the benefits provided by the product can be observed within a reasonably short period of time. 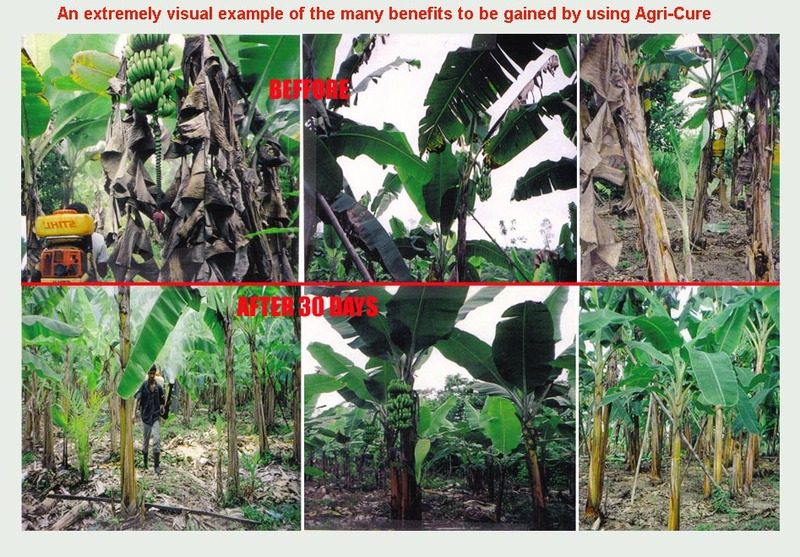 We recommend AgriCure™ product to resolve most of the problems associated with health and growth of Banana Trees. You can see the effect on RootRot, Siatoca fungus and the Cochinilla insect from attached pictures. We recommend AquaCure™ and BodyGuard™ products for the packing plants of fruit for export. AquaCure™ has a tremendous cleaning ability that will wash away insects and their eggs, larvae and pupae, Dirt, Spider Webs as well as fertilizers and insecticides residues. Furthermore, AquaCure™ posses Preservative Qualities by which shipping, storage and/or shelf life of fruits and vegetables are extended by up to 2-3 weeks when washed with diluted solution of AquaCure™. 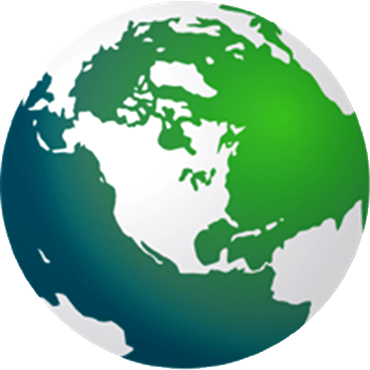 When combined with ionization, AquaCure™, further increases shelf life of produce. This is a significant advantage over previously used methods, in which most fruits and vegetables are spoilt by the time they arrive at sales centers or export ports. The reasons for the efficacy of AquaCure™ is that it is pH neutral, has anti-fungal, anti-mold, anti-bacterial and anti-parasitic capabilities, as well as absorption and adsorption characteristics that neutralizes methane gas and other gaseous emissions that deteriorate fruits. Thus, when fruits are brought from the field, they can be dumped in a holding tank containing diluted, AquaCure™ without need for chlorine. When the fruits are moved on the conveyor belt to the packing section, the fruits can be sprayed with a diluted BodyGuard™ which is an extremely potent Fungicide, Bactericide, Viracide including the most reistant strains. Thus it can prevent to prevent crown rot in bananas and in blue/black mold pineapples in addition to other wide range of pathogens.